The second part of my French adventure was to a new park, somewhere I was particularly excited about visiting: Parc Asterix. We had often driven past the mysterious park when visiting Disneyland when I was younger so, being the big kid I am, to finally visit fulfilled a little childhood desire. We stayed in the Hotel Des Trois Hiboux, Asterix’s own onsite 3 star hotel. I wasn’t expecting anything particularly great from the hotel; I was under the impression it was very small and with only basic facilities, but I was pleasantly surprised to say the least. The hotel is around the back of the park, approximately behind Goudurix, the huge Vekoma roller coaster. It’s nestled in a clearing in the Gallic Forest and is designed like a typical log cabin lodge. The restaurant is a buffet only, but the selection is excellent; it was considerably better (and cheaper) than the food in Disney. The highlight of the hotel though is the resident magician; although his show was geared to the smaller kids we were lucky enough to have a personal close-up magic show from him when we were at the bar. He was very friendly, he made the effort to speak English to us, and the magic itself was really remarkable. We arrived in the late afternoon with the intention of relaxing for the rest of the day and hitting the park early the next morning, but the audible roar of the roller coasters proved just too much for me so I decided to head in alone for a couple of hours before the park closed. I asked the receptionist at the hotel desk how I could get into the park, she told me since I had no ticket I’d have to drive to the front rather than using the handy hotel entrance, so when I told her I didn’t have a car she gave me a lift herself! If that’s not great customer service then I don’t know what is. I expected the park itself to be a little tacky; the cartoon/comic theme is very hard to pull off without it being so, but aside from the very garish entrance to the park (which is no bad thing) everything is very tasteful and unobtrusive, but still pretty immersive. My plan, having only a couple of hours, was to get on the 3 major roller coasters, so I headed straight to the back of the park to get on my most anticipated ride; Tonnerre de Zeus. The Custom Coasters International (CCI) woodie has topped Mitch Hawker’s Internet Poll 3 times (albeit 15 years ago) so I was expecting great things. Here in the UK we’re fairly devoid of airtime, and with my major international trips having been to Florida, Spain and California the only rides I’d ever been on at this point with substantial airtime are Stampida, another, smaller CCI and Desperado, a massive Arrow hypercoaster in the Nevada desert, both of which are derided by most enthusiasts. I chose the back row (being able to choose which row you want on the major coasters is a major plus point for the park) and before long I was being dragged up the lift hill. Despite being over 4000ft long, the track is almost completely hidden from sight from the front, and suddenly about half way up the lift you can see the sprawling track layout on both sides of you. The first drop is without a doubt the highlight of the ride, I’d rank it as my favourite drop on any coaster in fact, being at the very back you are literally yanked down the 100ft hill without touching your seat until you crash down in the tiny tunnel at the bottom. The high turnaround is forceful, by this point I had no choice but to hold on for dear life, and you are thrown into an airtime hill. This is followed by a series of powerful helices before you bounce off in an out-and-back style trip of little airtime hops. Finally you hit one last series of hills before curving round and back to the station. The ride is nonstop action from start to finish and it also manages to be very forceful whilst remaining smooth. My only slight criticism is that there is no real ejector airtime aside from the first drop, there are plenty of moments of nice floater, but still, the ride is just plain fun. 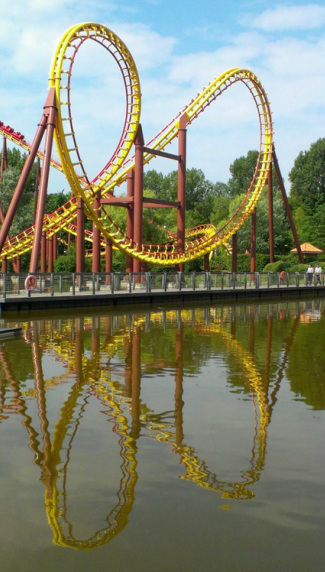 Next up was Goudurix, the notoriously rough Vekoma multilooper. Over the years I have had the ‘pleasure’ of going on a large number of the major coasters which are considered very painful (Colossus, Corkscrew, Gwazi, Furius Baco, Stampida, Manhattan Express) and generally I haven’t found them too bad (Gwazi being the exception) and Goudurix proved no different. I chose the centre of the train to negate the extreme forces and I genuinely enjoyed the ride. The first drop is huge, it seems much larger than the 108ft stat attributed to it, the Butterfly and Batwing are a little shaky but nothing unbearable, the loop is powerful and the double corkscrew is far kinder than a certain multilooper on the other side of the channel. There are then a few dips and turns before the train completes its circuit. It’s by no means the best coaster around, and it doesn’t compete with the B&M equivalents, but it’s a decent ride, and looks stunning. By now my time was running out; I had barely 45 minutes until closing so I ran as fast my legs could carry me off to Egypt to get on the park’s new for 2012 B&M inverter, Oz’Iris. After a short queue inside a beautiful station I was aboard. My anticipation was mixed; although I had read rave reviews of the ride I had also been slightly disappointed by Montu, a similar ride of the same model. But for the third time in three roller coasters my fears were quelled with the phenomenal first drop. Most inverters have gradual, curved drops but Oz’Iris rips up this custom with a diving, twisting, seemingly vertical descent, heightened by the fact that I was on the leftmost seat at the back as there is a support that feels inches away from your legs. It continues to abolish inverter tradition with its hugely impressive and long layout; the soaring inversions are contrasted by numerous sharp dives, the best of them being into a mist-filled tunnel, but the highlight of the whole ride is the final zero-g roll, which yanks you up and through the cluster of station buildings in a floating finale. I quickly realised that not only is the ride great, it’s Nemesis great; I rank it as just beating out Nemesis, but not quite as good as Zeus. As I headed back to the hotel I passed Vol d’Icare, the family Zierer coaster, and couldn’t resist since it had no queue. The ride was surprisingly fun; it’s basically just a lot of fast helices and a couple of much-too-near misses. The next day was much more routine, it wasn’t particularly busy so we had no rush to get on anything. We started off with a couple of circuits on Zeus; I did the back again and then tried the front, which wasn’t quite as good. Goudurix was running worse than the previous evening, the final turns were particularly bumpy, but it was still nothing unbearable. I got more time to appreciate the theming in the Oz’Iris area; it really is impressive. They manage to blend the humorous cartoonish side with realistic ancient Egyptian architecture such as obelisks and the Sphinx. The dancing water fountains are also a lovely touch. The sun was beating down now so we decided to cool off with a water ride, and we went for the largest of them all, a river splash called Le Grand Splatch. (I’ll let you guess what that means) The ride is pretty much exactly the same as Jurassic Park at Universal, except without the dinosaurs. I mean that in the sense that you spend a long time meandering around on a plateau covered in lush vegetation with the occasional water feature. (On Jurassic Park there’s Hadrosaur that spits water at you, here there’s virtually the same feature but without the dinosaur!) The meandering is pointless, but it’s quite pleasant, and the ledge that it takes place upon is completely man made but it doesn’t look artificial. Eventually you head over the summit back down to terra firma with a doubledown drop. As much as I love my food I wouldn’t usually go out of my way to chat about lunch, but where we ate, Arcimboldo, deserves mention. We came upon the restaurant and were drawn towards it simply because of its complete hideousness; its exterior is basically gigantic plastic fruit, but by virtue of the wine glasses on the tables (always a classy sign) we opted for it. Despite being crammed behind a strawberry the location was nice, with a view of the main lake, and we were even brought a non-ordered pre-starter. Both the selection and quality were fantastic; I had a beautiful steak but the lamb cutlets and seafood dishes were also met with happy faces. The longest queue of the day (at about 45 minutes, not much to complain about) was for Trace du Hourra, the largest Bobsled roller coaster in the world and my 100th coaster. I had found Avalanche at Blackpool Pleasure Beach to be deceptively intense, but this was very different. The ride covers a huge area of land as it’s almost 3000ft long, but because it’s so spread out it never really induces that much g force. It’s fun and fast without being intense, and with the innovative caveman theming it’s a very worthwhile midsize attraction. We rounded off the day with the park’s Vekoma Madhouse ride, Le Défi de César (The Challenge of Caesar). Obviously it’s Roman themed, but the exact details were quite hard to follow. There are various interesting rooms that build up to the finale: A picture taking room followed by a room of animations which paste your pictures onto the body of marching Romans (as weird as it sounds), then a rotating room with an animatronic Caesar before a very impressive Roman bath inspired room full of heavy water effects. The madhouse finale is well thought out; unlike Hex (Alton Towers) or The Haunting (Drayton Manor), where there’s no explanation as to why the room is spinning, here you are in a boat, and the boat is being turned over in the water, so there are screens in the walls that represent the spinning ocean very effectively. Overall it’s an excellent park; excellent major rides, excellent theming and excellent food. The level of queue jumping was disappointing, but that was no fault of the park. The hotel, too, was beyond expectations and customer service and friendliness made it somewhere I will definitely be visiting in the future.